The history of Mosaic Church goes back to the 1940s, when the then-called Bethel Baptist Church met for the first time with 35 members in a rented storefront. In the ensuing decades, the church broke records for missionaries and founded numerous churches throughout southern California and the world. Today, Mosaic maintains that drive with a (very) contemporary worship style that’s big on energy and spirit. The church moved into a new 750-seat sanctuary in 2012 with the sound reinforcement system that had been designed for its previous space. It didn’t fit very well, but now Mosaic is back to rocking concert-style services with a full-blooded Danley Sound Labs sound reinforcement system, with point-source clarity, low distortion, stellar pattern control, and abundant SPL. With assistance from Joel Moak, Danley’s western region sales manager, Grabe designed a dual mono system using Danley components. Each mono system delivers complete coverage by itself. The center mono system is comprised of two Danley SH-96HO loudspeakers, splayed to cover either side of the room, paired with two end-fired Danley TH-118 subwoofers. Drums, bass, and vocals are routed through the center mono system. 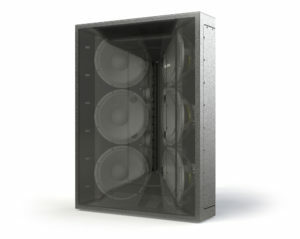 The side mono system is comprised of two Danley SH-64 loudspeakers, each on either side of the center mono system. Guitars and keyboards are routed through the side mono system. Two four-channel Danley DNA 20K4 Pro amplifiers power the system. One powers the two SH-96HOs, each of which is biamped. Two channels of the other DNA 20K4 Pro power the subwoofers, and its remaining two channels power the SH-64s. On-board DSP provides modest loudspeaker conditioning, with a Danley DNA SC48 processor and system controller at the front for overall system DSP. “Monitoring the current draw and voltage output when the band is at full tilt is shocking – the amps aren’t breaking a sweat,” Grabe said. “And the peak, thermal, and excursion limiters provided in the Danley DSP give us peace of mind with a team of rotating mix engineers.” In addition to all the Danley gear, a new Soundcraft Vi7000 mixer serves as the FOH interface, providing mixes for the house, in-ear monitors, and broadcast.